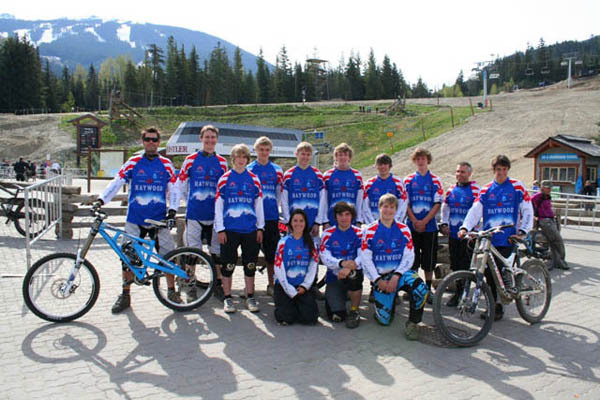 Cycling BC coaches organized two training camps at the Pacific Institute For Sports Excellence for Downhill team members. These Cycling BC athletes were exposed to many different and exciting training and testing tools that the PISE confidently and professionally have available to National and International individuals and teams. The first camp in November primarily focused on fitness and strength techniques plus cardiovascular, including a first taste of ''MAP and sprint testing''. Each athlete gave their every ounce of attention and strength into this training weekend. Dave Hord: "As a Cycling BC Coach I was very proud to see each one of them step up and take everything on board and really show their true dedication to this dynamic and existing sport." After the first testing weekend there was a solid base to work from with this highly skilled team of athletes, so off we went to pursue their passion - being strong, being focused and being fit for their demanding season ahead. With many hours in the gym, on bikes at the pool and in the kitchen, we then headed back to the PISE last weekend to see results of these athletes. Kip Shortreed: The Cycling B.C. Downhill Team's second fitness testing at Victoria's Pacific Institute of Sports Excellence went extremely well. I have been dedicating my whole off season to the spin bike and weight training. To go back and take another M.A.P test after a few solid months of training and get improved results that you can feel as well as see in the data makes the long, hard hours in the gym worthwhile. It's awesome to see the entire team improving and excited about training - we're all taking things to the next level of what we're used to. The team is close as we've been together for a few years now and everyone is cheering everyone else on. We were aided in recovery, as well as participated in nutrition and mental workshops. It was a bomber weekend and the team is going to be on FIRE this season, thanks to everyone for all the help to make this happen. Miranada Miller: Just got back from a weekend in Victoria for round two of M.A.P. testing for the Cycling B.C. Downhill Team. It was a great success, with everyone improving greatly from their last tests. It's extremely encouraging to see the amount you've improved, knowing that the training is working and paying off. After our tests we did the cold pools, compression pants and underwater treadmill to aid in recovery, then attended a nutrition seminar. We finished the weekend with a mental training workshop and a rockin' race in the Aztec back to the ferry. Lots of work goes into make this happen. Thks all.